The Healthy Hoff: What is Quinoa? Quinoa, pronounced as KEEN-WAH, is actually a seed, not a grain - a common misconception. However, it is prepared and used in the same manner as rice or couscous. It is gluten-free for those of you with touchy inner workings, making it easy to digest. It has the texture and look (size) of Couscous, but tends to be a little crunchier, brown in color and has a slight nutty flavor. Quinoa has been around a little while - since 3,000 B.C. The Incas once revered this sacred staple as the "mother grain." - as it was so substantial as to fuel its mighty armies. Yes - it's very nutrient rich! Quinoa is high in fiber, high in protein, a good source of phosphorus, magnesium, iron, vitamins, minerals, and is considered to be alkaline. It's high in calcium and iron and a good source of E & B vitamins. 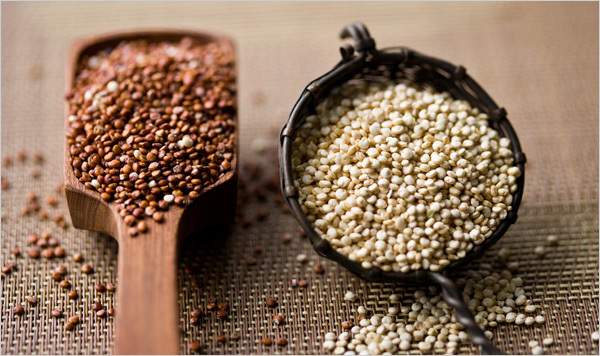 Since Quinoa contains a balanced set of essential amino acids, it is considered a complete protein source. Quinoa can be easily substituted in place of Rice, Couscous, Millet or Pasta in just about any meal. Use it as a side dish, in casseroles, in cold salads, soups or stews. Add nuts and fruits to cooked Quinoa and serve as breakfast porridge. The Quinoa seeds can also be sprouted for a super raw nutritional snack! Sprouted Quinoa can be used in salads and sandwiches just like alfalfa sprouts. Quinoa cooks up simply and fast. For every 1 cup of Quinoa, use 1 1/2 cups of Water or Veggie Broth. Bring Quinoa & liquid to a boil together, reduce to a simmer, cover & cook for 15 minutes. Once cooked, remove from heat and allow to stand for 5-10 minutes, fluff with a fork and enjoy! Adding Salt to the cooking water will increase the cooking time by 1 - 2 minutes and yield a firmer texture. Leave it out and you get a fluffier end result. Want a nuttier flavor? Dry roast the Quinoa before cooking; to dry roast, place it in a skillet over medium-low heat and stir constantly for five minutes. It is important to rinse Quinoa using a fine wire mesh to remove the bitter outer layer (saponin), prior to cooking. With this in mind, the Quinoa can be soaked up to 5 minutes to help with this process. Store quinoa in an airtight container. It will keep for a longer period of time, approximately three to six months, if stored in the refrigerator.